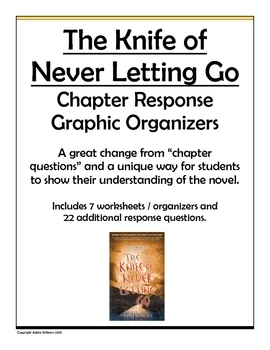 This 8-page package includes seven pages of graphic organizers for students to use while reading Patrick Ness's "The Knife of Never Letting Go". 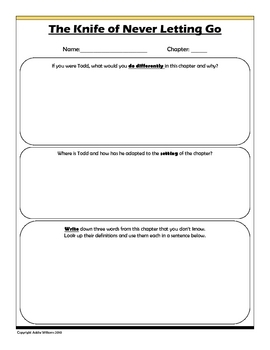 The organizers are a way for students to repsond to the novel in a slightly different way. The first worksheet is a quick-version, and the following four sheets can be mixed and matched in various combinations. You also get two "blank copies" to add your own response questions. 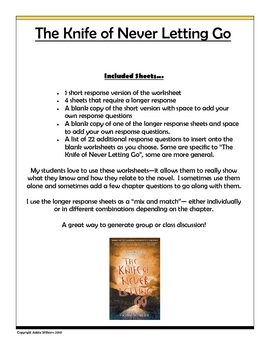 Lastly, I've included a list of 22 response questions to use with the blank sheets as you choose. Students are asked to analyse, judge and predict the events in the novel. 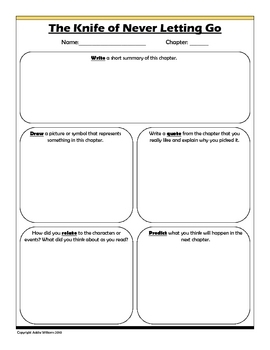 A GREAT alternative to standard question and answer worksheets for a novel. My students have really enjoyed using them - great for all abilities!